A celebration of the life and work of world-renowned Catalan surrealist sculptor and painter Joan Miró, the Joan Miró Foundation in Barcelona houses the majority of the artist's works, including paintings, drawings, sculptures and textiles. Distinguished by his use of primary colours, simple lines and two-dimensional geometric shapes, Miro refused to be categorised into an established art movement and as a result continued to create unparalleled works of art. 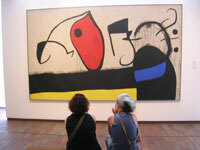 Another product of original artistic genius from Barcelona, the works of Miró at the Joan Miró Foundation allow visitors to further delve into the unrestrained creative energy of this exceptional city. The building housing the collection was designed by Josep Lluis Sert and is unique and odd, an appropriate shell for the works of Joan Miro. The museum hosts a wide variety of temporary exhibitions by other artists, aiming to promote contemporary art in general, rather than just the work of Miro, and also hosts some workshops and lectures. As an added bonus there are some fantastic views across the city from the museum. Tickets can be booked online via the official website and audio guides can be rented, which are a big help in understanding and interpreting the art. Transport: Funiculer from Paral-lel metro station, or Parc Montjuic bus 50, 55 or 193. Opening times: Open Tuesday to Saturday from 10am to 7pm (October to June) and 10am to 8pm (July to September); open Sundays and holidays from 10am to 2.30pm. Closed on Mondays. Admission: €11 (adults); audio guides €5. Concessions available.